Laura is a Clinical Nurse Specialist in Psychiatric and Mental Health Nursing. She graduated from Wheaton College with a B.A. in philosophy, and holds a Master of Science in Nursing from the MGH Institute of Health Professions. She is licensed to practice Nursing in the Commonwealth of Massachusetts. She is certified by the American Nurses Credentialing Center as an advanced practice nurse specializing in Psychiatric and Mental Health Nursing. Laura brings her experience working with clients in inpatient, outpatient, partial hospitalization, day treatment, and community health settings. Laura’s focus is upon empowering and educating clients to make behavioral changes. She provides individual counseling and group therapy aimed at increasing clients’ knowledge and motivation to improve their mental and physical health, and increase their independence and life satisfaction. Ethan received his Master's Degree in Social Work from Simmons College in 1969 and joined Programs For People as a founding member in 1973. Mr. Harris completed the family training program at Cambridge Family Institute from 1977-78 and studied at the Centro Milanese Di Terapia Della Famiglia in Milan in 1984. He served as editor of Family Issues from 1987-1994 and the Newsletter of the American Family Therapy Academy from 1994-1998. His publications include, "Crying, Sleeping, and the Post Modern Marriage" in the Journal of Feminist Family Therapy (1999) and "My Brother's Keeper: Siblings of Chronic Patients as Allies in Treatment" in Siblings in Therapy. He has served as visiting professor at Boston University and Simmons College Schools of Social Work and has been a field instructor for Simmons School of Social Work for over 30 years. Dr. Goldbarg graduated from Harvard College and Boston University School of Medicine. He completed a residency in adult psychiatry at McLean Hospital. He is licensed to practice medicine in the Commonwealth of Massachusetts and is certified in the specialty of Psychiatry by the American Board of Psychiatry and Neurology. He has been practicing psychiatry for over 30 years. In addition to his consulting responsibilities, he is involved in Program For People's Inservice Training Program for interns and staff members. Stephanie received her degree in Business Management from Providence College and is the agency's Financial Data Manager, responsible for the billing, accounts receivable, and coordination of payroll and benefits. She has had over 25 years experience in both private and public sectors. She has been employed by Programs For People since 1983. Dan received both his B..A and M.A. in Psychology from Framingham State College, and is a Licensed Mental Health Counselor. As part of his training he did his counseling internship at Programs For People, and upon completion of his internship was hired as a full-time member of the staff. Dan served as a counselor at Programs For People for 10 years, and then for the next 9 years was employed by the Massachusetts Behavioral Health Partnership and Boston Medical Center HealthNet Plan as an access line clinician and a team leader. In those roles he was involved with treatment planning and authorization of care for MassHealth recipients. Dan recently returned to Programs For People as after being away from direct client care for a period of time he was eager to return to the program where he had learned many of his clinical skills to resume a role where he could have greater impact upon improving the lives of others. At Programs For People Dan provides individual counseling, facilitates groups, and supervises clinical interns from master's level counseling programs. Beverly received her Associate in Science degree from Lasell College. She has served as Administrative Assistant/Executive Secretary at Programs For People since 1990. 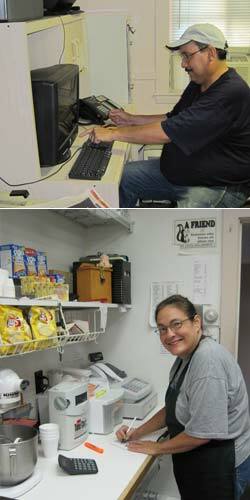 Ed has a long history of restaurant management, as well as service to the community. He owned and operated a 145 seat Italian Restaurant for 37 years. He has also worked for Burger King Corporation and Panera Bread as a training manager. Ed has a lifelong history of service to community organizations. He has served as a Cub Master and Eagle Scout Advisor for Boy Scouts of America; he has served as past president of Waltham Jaycee’s and past Board member for United Cerebral Palsy (Boston Housing Unit). He has been an active participant in the Massachusetts Knights of Columbus for many years, most recently serving as District Deputy. Ed previously worked for Programs For People as Food Service Manager for 7 years, helping many clients in our Lunch Box program prepare for community employment. After a brief retirement, he recently rejoined Programs For People and looks forward to helping new clients build their confidence and work readiness skills. Sarah holds a B.A. in Psychology from Lake Forest College and has 10 years of experience working vocationally with individuals with a wide range of disabilities. Past positions have included serving as a Program Coordinator for the Massachusetts Rehabilitation Commission and Employment Counselor for Project Advance at Programs For People. She recently returned to Programs For People to resume a counseling career. Her responsibilities include providing vocational counseling and job placement for Project Advance, as well as serving as liaison between Project Advance and the Massachusetts Rehabilitation Commission. Jess received her Master's Degree in Occupational Therapy from Boston University/Sargent College for Allied Health Professionals and has had 15 years of experience in mental health settings, including serving as occupational therapist for the inpatient unit at Bournewood Hospital and as Community Residence Director at Wild Acre Inn in Lexington. She also has experience working in rehabilitation at Community Rehab Care in Newton, treating cognitive and physical impairments resulting from neurological injuries. Jess brings a focus on the use of functional and cognitive based strategies to assist clients in managing day to day activities. Mary Jane graduated from the University of Minnesota with a Bachelor of Arts degree in Psychology, and earned a Master of Science degree in Rehabilitation Counseling from Southern Illinois University’s Rehabilitation Institute. She is a Certified Rehabilitation Counselor. She has worked as a Rehabilitation Counselor in many capacities with persons with a variety of disabilities, from clinical settings such as the New England Rehabilitation Hospital to corporations including Paul Revere Insurance Company, Raytheon, and the John Hancock Insurance Company where she coordinated vocational rehabilitation for employees. Prior to coming to Programs For People she worked with the Boston Veterans’ Administration, providing vocational assessments and recommendations for disabled veterans. Mary Jane serves on the Board of the Massachusetts Rehabilitation Association. Tony earned a Bachelor's Degree in Special Education from Boston College and a Master's Degree in Public Administration/Disability Policy from the Sawyer School of Management at Suffolk University. He has over 30 years of experience supporting people of all abilities in achieving their goals of working in the community. He has worked in both public and private sectors to develop successful employment opportunities by matching the skills and interests of the individual together with the needs of the employer. He is a strong advocate for community participation, believing in the dignity of work that fosters a person's self-esteem and value as a contributing member of society. Tony has extensive experience working with state agencies, advocacy organizations, businesses, and chambers of commerce. Jonathan graduated from Boston University with a Bachelor of Arts in Sociology. He earned his Master’s in Counseling Psychology from Lesley University after completing a clinical internship at Programs for People. Jonathan has experience in outpatient counseling and psychiatric day-treatment settings, and provides individual and group counseling. He has a particular interest in Existential-Psychoanalytic and Narrative therapies, and continues his education in these approaches. Jonathan is motivated by a desire to help clients understand where problems originate. He emphasizes strengths-based, non-pathologizing perspectives in the treatment of and recovery from the symptoms of mental illness. A lifelong New England resident, Jonathan’s passions include hiking in the White Mountains, playing the guitar, reading, and traveling in Ireland.